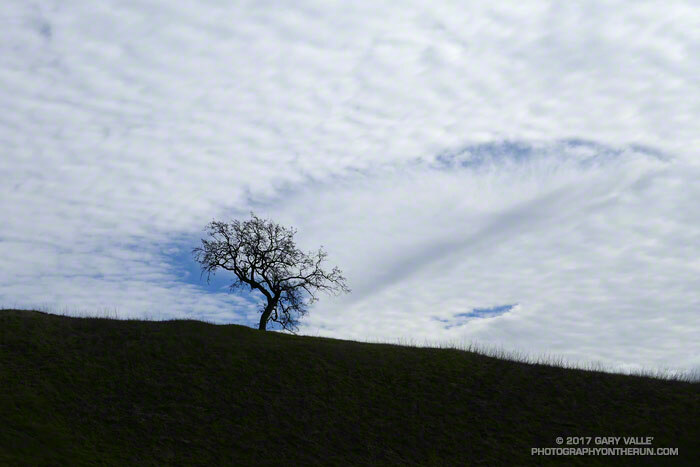 The oval disturbance in the layer of altocumulus clouds in this photograph is a relatively rare phenomenon called a fallstreak hole or hole punch cloud. These altocumulus clouds are formed from super-cooled water droplets many times smaller than a raindrop. The droplets are in a liquid state even though the temperature is well below freezing. When disturbed by an aircraft passing through the layer the droplets freeze and precipitate out of the cloud as virga. This and other processes create the hole. The photo was taken on Saturday, January 21, 2017 at 2:23 p.m. near the Las Virgenes trailhead of Upper Las Virgenes Canyon Open Space Preserve. The hole was well south of the area. 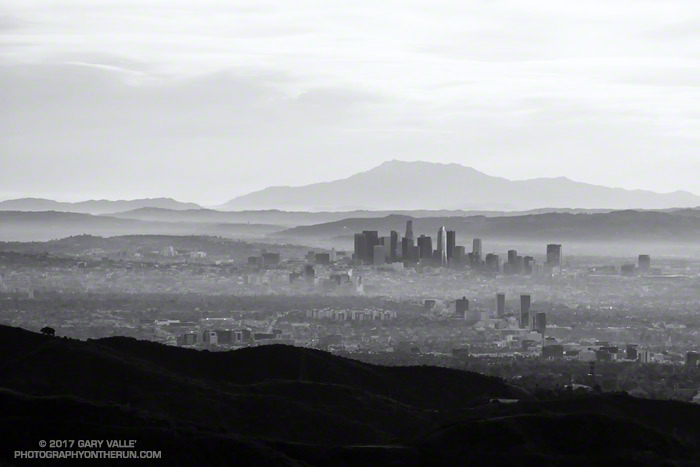 Downtown Los Angeles, with San Jacinto Peak in the background, approximately 110 miles distant. San Jacinto Peak is a bit over 10,800 feet in elevation. The photograph was taken from a viewpoint off the Temescal Ridge Trail while doing a loop from the End of Reseda to Will Rogers State Park earlier this month. As of yesterday Downtown Los Angeles (USC) has recorded 8.80 inches of rainfall for both the Rainfall Year (July 1 – June 30) and Water Year (October 1 – September 30). By either measure Los Angeles rainfall is well above normal, and with three well-advertised storms in the forecast it looks like Los Angeles rainfall could remain above normal for at least a few weeks. Even if it has been a bit wet — and muddy — it’s been great to have a more normal rain season. The rain has been very beneficial and has impacted the drought, at least in the short term. Just how much a continued wet rain season would impact the drought in the long term is a question that has to wait for future analysis. There has been a five year precipitation deficit of nearly 36 inches at Downtown Los Angeles (USC). It’s hard to appreciate the size of this deficit while running in the rain, splashing through puddles, and trying not to slip in the mud. One tangible indicator of this deficit is that despite above average rainfall, many creeks in the Santa Monica Mountains and Simi Hills have remained dry or are barely flowing. Some have been dry for years. Update Wednesday, March 1, 2017. The atmospheric river event on February 17 produced high flows on many local streams and many of these streams continue to flow. Rainfall totals in Los Angeles, Ventura and Santa Barbara Counties for the storm generally ranged from 4 to 8 inches with some higher totals recorded. On subsequent trail runs flooding, debris flows and erosion were noted in Upper Sycamore and Blue Canyons in Pt. Mugu State Park. Remarkably, some groundwater monitoring stations in Santa Barbara and San Bernardino Counties remain well below normal. As of February 28, 2017, Downtown Los Angeles (USC) had recorded 18.50 inches of rain for the Rain Year and Water Year. This is 165% of the normal amount of 11.24 inches for the date, and 124% of the normal amount of rainfall for an entire year. This is the wettest Rain Year (July 1 – June 30) and Water Year (October 1 to September 30) to date since the very wet year of 2004-2005. Update Tuesday, January 24, 2017. From Wednesday, January 18 through Monday, January 23, Downtown Los Angeles (USC) recorded 5.53 inches of rain, bringing the Rain Year and Water Year precipitation totals to 14.33 inches. This is 217% of the normal amount of 6.65 inches for the date, and 97% of the normal amount of rainfall for the entire Rain Year. It has been the wettest start to the Rain Year (July 1 – June 30) and Water Year (October 1 to September 30) since the very wet year of 2004-2005. There were high rain rates on Sunday, January 22, and Upper Las Virgenes Creek did finally flow for a period of time. Update Saturday, January 21, 2017. From Wednesday, January 18 through Friday, January 20, Downtown Los Angeles (USC) recorded 2.53 inches of rain, bringing the Rain Year and Water Year precipitation totals to 11.33 inches. The average annual rainfall for Downtown Los Angeles is 14.93 inches. The rain, which was heavy at times on Friday, produced some flooding, rockslides and debris flows. Both branches of upper Garapito Creek are flowing as a result, but Saturday afternoon Upper Las Virgenes Creek was still not flowing. Upper Las Virgenes Creek – February 22 the flow on Upper Las Virgenes Creek near the Cheeseboro connector and the two downstream crossings was enough that you couldn’t cross without getting your shoes wet. Previously, on January 24, there was no flow near the connector and only a slight trickle downstream. On January 21 the creek was not flowing and there was no evidence it had flowed during a recent storm. Garapito Creek – On Saturday, January 21, 2017, both branches of upper Garapito Creek were nice burbling brooks. Previously, on January 15, the north branch was just starting to flow, but the south branch was dry. Upper Sycamore Creek – Flash flooding, debris flows and erosion occurred on this creek following the heavy rain on February 17-18. Nearly 6 inches of rain was recorded at Circle X Ranch, which is also in the western Santa Monica Mountains. Previously, was flowing on February 4, but not on January 1, 2017. Serrano Creek – Was flowing on February 4, but not on January 1, 2017. If the wet forecast holds will these streams start to flow? We’ll see! 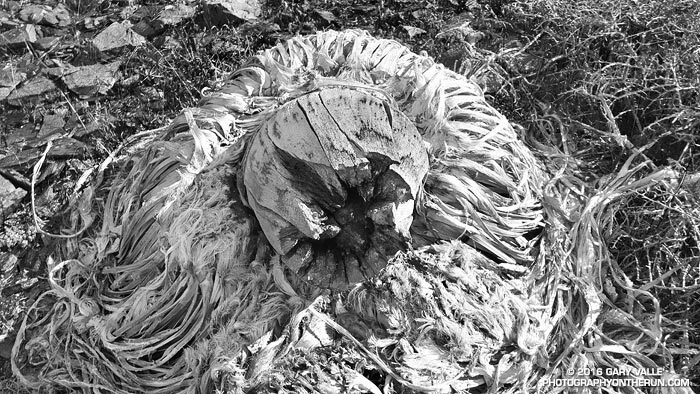 From the Excursion to Ross Mountain. Climbing up a scenic ridge is a great way to start a trail run, especially when it ends at an interesting vantage point and can be extended into a loop. The Topanga Lookout Ridge is a mile and a half long ridge that extends from near the junction of Calabasas Peak Motorway and Red Rock Road to the Topanga Lookout. Well-defined ridges of this length are uncommon in the Santa Monica Mountains, especially those with trails along their crest. 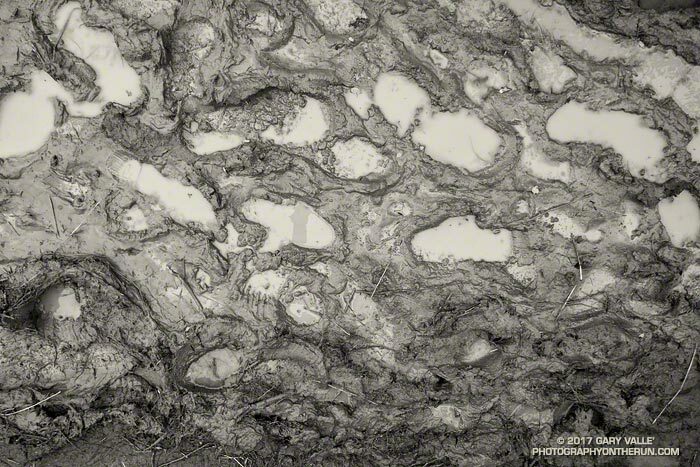 This one owes it existence to the Red Rock/Calabasas Peak Fault. Upthrust rocks along Topanga Lookout Ridge. The path following the ridge is well-used and generally non-technical, but there are a few spots where it is necessary to scramble up, over, or around a short rocky section. From the Lookout the loop can be completed by following the Topanga Tower Mtwy southwest to the junction of Stunt, Schueren and Saddle Peak roads, then picking up the Backbone Trail and continuing west to the top of the Stunt High Trail. 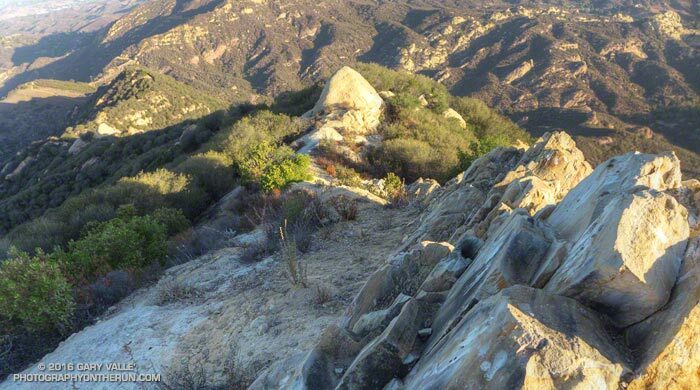 The Stunt High Trail can then be followed down to the trailhead at Cold Canyon Preserve on Stunt Road. The total length of the loop is a little under 8 miles, with an approximate elevation gain/loss of 2000′. A side trip to Saddle Peak adds about 0.8 mile. 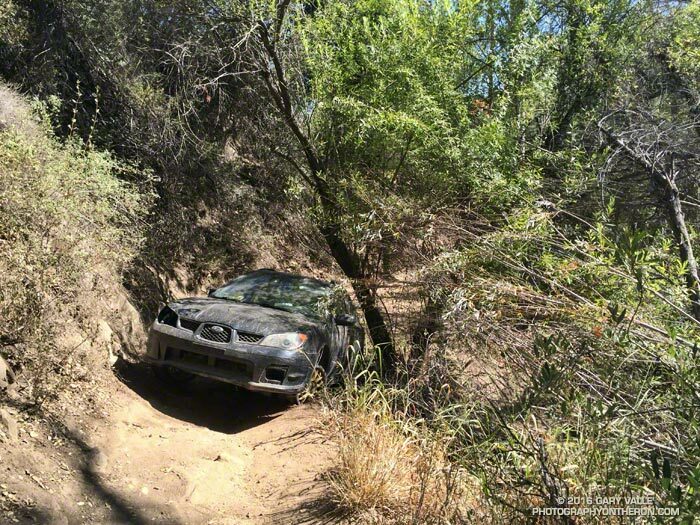 When you run a lot of miles, you see a lot of things, but I have to say I never expected to see a Subaru Impreza at Sulphur Springs on the the Cheeseboro Canyon Trail.